Citation Information: J Clin Invest. 2018;128(6):2551-2568. https://doi.org/10.1172/JCI97426. 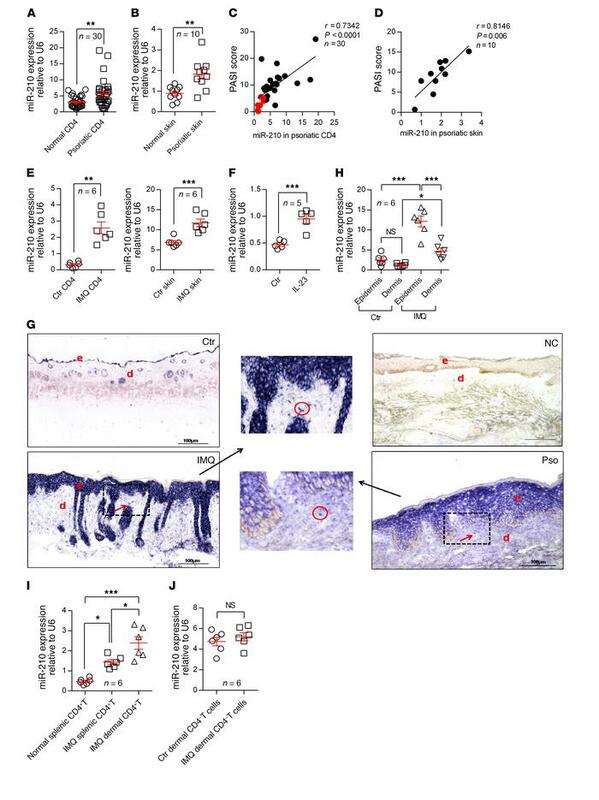 miR-210 expression is elevated in psoriatic CD4+ T cells and skin lesions. (A and B) Expression of miR-210 in CD4+ T cells (A, n = 30) and skin samples (B, n = 10) derived from psoriasis patients and healthy controls. (C and D) Correlation of human miR-210 expression in psoriatic CD4+ T cells (C, n = 30) or skin (D, n = 10) with PASI scores. (E) Expression of miR-210 in splenic CD4+ T cells (left panel) and skin samples (right panel) from untreated mice (n = 6) and IMQ-induced mice (n = 6). (F) Expression of miR-210 in skin lesions from normal ears (n = 5) and IL-23–treated ears (n = 5) of mice. (G) In situ hybridization was performed on mouse skin treated with vehicle (Ctr, n = 5) or IMQ (IMQ, n = 5) as well as human skin from healthy controls (NC, n = 6) and psoriasis patients (Pso, n = 5) using miR-210–specific LNA probes. Dark blue color indicates miR-210 expression. e, epidermis; d, dermis. Scale bars: 100 μm (lower magnification) and 50 μm (higher magnification). Red arrows indicate dermis-infiltrating inflammatory cells. (H) Expression of miR-210 in the epidermis and dermis of skin samples from untreated controls (n = 6) or IMQ-treated mice (n = 6). (I) miR-210 levels in CD4+ T cells derived from untreated mouse spleen (n = 6), IMQ-treated mouse spleen (n = 6), and IMQ-treated mouse lesional dermis (n = 6). (J) Expression of miR-210 in dermal CD4– T cells of skin samples from untreated controls (n = 6) or IMQ-treated mice (n = 6). Data are pooled from 2 independent experiments (A–D) or are representative of 3 independent experiments (E–J) in BALB/c mice (E and G–J) and in C57BL/6J mice (F). Data represent the mean ± SEM. *P < 0.05, **P < 0.01, ***P < 0.001. Two-tailed Mann-Whitney U test (A and B), 2-tailed unpaired Student’s t test (E, F, and J), Spearman’s r test (C and D), or 1-way ANOVA with Bonferroni’s post hoc test (H and I) was used.